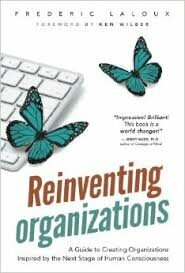 I recently read a most remarkable book, Reinventing Organizations by Frederic Laloux. Ken Wilber calls it “spectacular…pioneering.” Jenny Wade calls it “brilliant…a world changer.” I couldn’t agree more. Why it particularly speaks to me is that it is the organizational complement to the deep development we undertake individually in bringing Zen into leadership development. It is the blueprint by which a Zen Leader can reinvent his or her organization. What Laloux puts into perfect context is that organizations – as a way of collaborating - have been evolving for as long as humans have been forming them. And that at every stage of development, a new form of organization becomes possible, which is better suited to the complexity of the times. He traces this development through the most primitive tribes, to might-is-right conquerors (e.g., street gangs), to organizations based on a conformist hierarchy (e.g., Catholic Church), individual achievement (e.g., Wall St. banks), and up to pluralistic empowerment (e.g., Whole Foods). Today we’re on the cusp of a new stage of human consciousness that he calls evolutionary, inspiring a new kind of organization. Twelve such evolutionary organizations became the research backbone of this book, from which Laloux distilled the culture, behaviors, structures, and HR processes that will reinvent organizational life. What struck me in reading the book was that, given the speed and complexity of our times, and what it takes to engage the more purpose-driven, next generation digital natives, evolutionary organizations are going to have a real evolutionary advantage. Take decision making, for example. In traditional, conformist organizations, decisions are made top-down. The challenge with that in today’s environment is that conditions “on the ground” change too quickly for data and decisions to make it up and down the chain of command. Moreover, too many people become disengaged and dissatisfied with decisions over which they have no control. More modern organizations have moved to increasing amounts of empowerment at the front line, whether that’s a customer service representative or a special forces team. But still, for decisions outside of one’s empowered realm, most organizations rely on a cascading governance process involving many meetings and power point slides. Some organizations have made a pluralistic attempt at consensus-based decision making, but find it consumes too much time and dilutes accountability. The breakthrough evolutionary practice around decision making is what’s called the Advice process, where one is 100% accountable for decisions pertaining to one’s work, but must seek the advice of anyone affected by the decision. There are practices around how to seek advice and give advice when sought out, as well as surprisingly little-used mediation processes for disputes. But for the first time in organizational history, there’s no super-decider at the top who will intervene or make the call. The results, based on Laloux’s research, are more effective decisions in less time with radically fewer meetings and total ownership. An evolutionary advantage. What holds the evolutionary organization together is a sense of purpose – not as flowery words on a wall – but a living purpose enacted through distributed leadership connected to one’s personal calling. Of course, it takes a certain maturity to function in an organization like this, and a fairly awakened CEO and Board to even want to create an organization this way. But the business results and personal satisfaction people take in achieving them are staggering. All of which gives me enormous hope that the deep development we accelerate in bringing Zen and leadership together will have a way to manifest in reinvented organizations that can heal some of the wounds of our world. This blog is dedicated to the concepts described in the book The Zen Leader by Ginny Whitelaw. In this blog we discuss how these concepts are applied to a variety of current situations and applications, helping us all unleash the Zen Leader within us!